A combination of factors helped the GBP/USD pair to reverse an early dip on Tuesday, to fresh three-week lows, and jump back above the 1.2900 handle amid broad-based US Dollar weakness. Against the backdrop of the latest optimism over a possible US-China trade deal, news that the US lawmakers have reached a tentative budget deal to avert another partial government shutdown boosted investors' appetite for riskier assets. The risk-on mood prompted some USD profit-taking, especially after the recent run-up to the highest level since December, and was seen as one of the key factors behind the pair's initial leg of rebound. Meanwhile, absent relevant Brexit headlines and any dovish comments by the BoE Governor Mark Carney extended some additional support to the British Pound and remained supportive of the pair's goodish intraday up-move of around 75-pips. The pair built on the overnight bounce and continued gaining positive traction through the Asian session on Wednesday. Today's economic docket highlights the release of UK consumer inflation figures, expected to have retreated below 2.0% y/y rate in January, which coupled with any fresh Brexit-related headlines (if any) might continue to infuse some volatility around the major. Later during the early North-American session the headline US CPI print would influence the USD price dynamics and produce some meaningful trading opportunities. From a technical perspective, the pair is now looking to move past 100-hour SMA immediate strong hurdle, now coinciding with the top end of a short-term descending trend-channel formation on the 1-hourly chart. A convincing break through the mentioned confluence resistance might prompt some aggressive short-covering and assist the pair to make a fresh attempt towards reclaiming the key 1.30 psychological mark. On the flip side, the 1.2885-80 region now seems to protect the immediate downside and is closely followed by support near mid-1.2800s, which if broken might negate prospects for any near-term up-move and turn the pair vulnerable to extend its recent downfall. 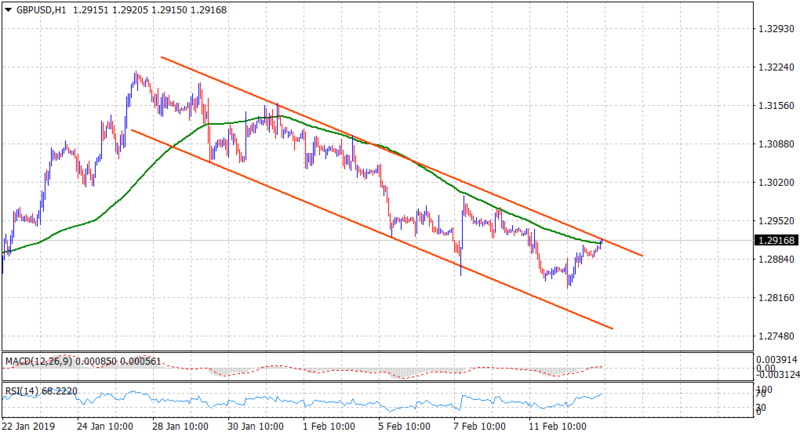 The downward trajectory has the potential to drag the pair even below the 1.2800 round figure mark towards challenging the trend-channel support, currently near the 1.2765 region.